Based on director's Ying Liang's own experiences, FAMILY TOUR tells the story of a an exiled film director and her family who travel to Taiwan nominally for a screening of one of her films. 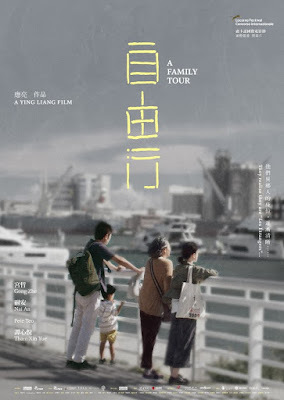 In reality the trip is so they can shadow/meet her ailing mother who is on a trip with a Mainland Chinese group, without their being and suspicion. A well done drama that hits all the right notes still kind of disappoints. Not because it's bad but because the film hits all of the thematic elements you expect it to exactly as you think it will. Being a long time fan of Asian film and a follower of Chinese politics I pretty much figured out how this was going to go and what it was going to say before I sat down to watch the film. To be honest had the film not been playing the New York Film Festival I wouldn't have thought anything about it. but considering it is at NYFF and it is playing at the same house where the New York Asian Film Festival happens I'm left to wonder why the game wasn't raised. NYAFF's selections were much more challenging and thought provoking. NYFF should have one upped its sister at every turn.